Magnus Carlsen, the World Champion from Norway, is widely reputed to earn more than $1 million a year from prizes, appearance fees and sponsorships. For most people that would be a very good income. But consider that Novak Djokovic, the world's top-ranked player who is from Serbia, picked up two million euros for winning the French Open and was estimated to have earned almost $56 million in 2015 by Forbes magazine. The money disparities between chess and tennis (and other sports) are greater a little further down the rankings. For example, the 10th-ranked chess player in the world (at the moment, Wesley So of the United States) would probably be doing well to net six figures this year, which is certainly not extraordinary. At the same time, the 10th-ranked tennis player (Richard Gasquet of France), who earned more than $2 million in 2015, probably makes more than Carlsen. It is not really surprising that tennis players (and competitors in other sports) make more than chess players, but there is something, if not unfair, at least disproportionate in the disparity. Just like tennis players, top chess players need talent and many years of practice to get to the top of their profession. And while elite chess players are not world-class athletes, nonetheless they need to be in peak physical condition in order to concentrate and endure hour-after-hour of stress that is typical of top-level competitions. They also have to prepare and train many hours every day before and during tournaments. Chess is also popular. No, tens of millions of people do not watch top chess matches online, but hundreds of thousands do and over the course of a five-hour match in an elite event, a million people or more may "tune in" to see the action. The number of people who play chess regularly is not known precisely, but surveys and estimates put the number at least in the tens of millions. With schools in many countries adding chess to their curricula because of growing body of research that it has educational benefits, the numbers are likely to grow in the future. Top chess players are never likely to earn as much as sports stars, but things have improved a bit in the last couple of years. In 2014, the Millionaire Chess Open debuted in Las Vegas, offering $1 million in total prizes. So won the inaugural event, walking away with $100,000. Hikaru Nakamura of the United States, currently ranked No. 6 in the world, won the tournament in 2015. Last year also saw the launch of the Grand Chess Tour - a year-long competition combining three established tournaments (Norway Chess, the Sinquefield Cup and the London Chess Classic) with a total prize fund of $1.05 million -- $300,000 for each tournament and season-ending bonuses of $150,000. Carlsen won the series, earning $215,000, while Anish Giri of the Netherlands was second with $155,000. The Grand Tour has returned this year and the participants include many of the world's top players: Nakamura, So and Fabiano Caruana (ranked No. 3) from the United States; Vladimir Kramnik of Russia, No. 2; Levon Aronian of Armenia, No. 4; Maxime Vachier-Lagrave of France, No.5; Giri, No. 8; Viswanathan Anand of India, No. 11; and Veselin Topalov of Bulgaria, No. 13. Several other top players, including Carlsen, will play in some events, but not all. The Tour kicked off last week, albeit with a slightly different format as Norway Chess dropped out to go its own way. It has been replaced by two tournaments at faster time controls - the one last week, which was in Paris, and one that will follow this week in Belgium, each with a prize fund of $150,000. 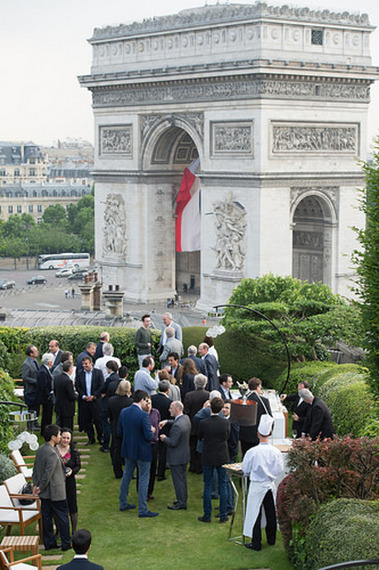 Vivendi, the giant French media company, was an important sponsor of the tournament in Paris. 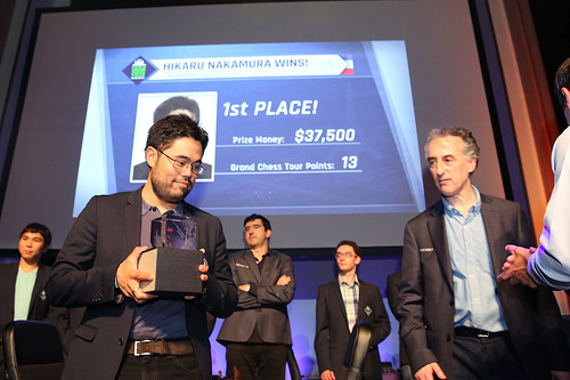 Nakamura won the event in Paris, earning $37,500, followed closely by Carlsen, who won $30,000. Nakamura was a bit fortunate -- winning a blitz game against Topalov on a technicality when Topalov made a mistake in promoting a pawn to a queen, and a couple of other games in which he was all but lost but stormed back after his opponents made errors. But Nakamura also won some games with great technical skill. If the Grand Chess Tour, Millionaire Chess and other similar tournaments can arise and thrive, being a professional chess player might become a better occupation for more than just a fortunate few. But it is difficult task to attract and retain sponsors. After giving out $1 million in prizes its first two years, and losing hundreds of thousands of dollars each time, Millionaire Chess is not able to live up to its name this year: It is offering no more than $510,000 and the total prize fund might be as little as $306,000, depending on the number of entries it receives. Mr. McClain is editor-in-chief of WorldChess.com, the official site of the World Chess Championship.